From now till 28 October 2016, pick 2 out of 6 selected main courses at Fish & Co and enjoy the lower value item FREE! 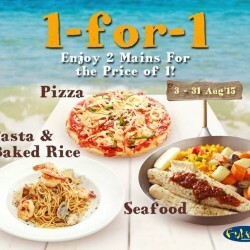 Valid for dine-in on weekdays, excluding Friday 6pm - 10pm, eve of PH & PH. Hurry, grab a kaki and dive in! Before we say goodbye to Fish & Co at Glasshouse, let's enjoy the food and atmosphere there with your family and friends! 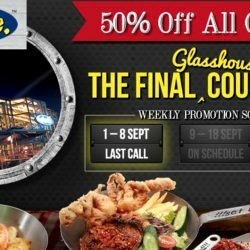 This is their best farewell promotion yet, get 50% OFF ANY COMBO All Day, Every Day (except Fri & Sat from 6pm – 10pm, eve of PH & PH)! Make your reservations now! Great Singapore Sale? How does The Great Glasshouse Sail sound?! It’s fin-ally the season to get hooked on some ‘hard-to-miss’ deals! Now till 31 July (yes, that’s 2 whole months of great savings), indulge in Fish & Co's 1 For 1 Main Course every day, from Monday to Friday! From now till 23 Dec 2015, order a main course and have another on the house at Fish & Co's East Coast outlet! Hurry, grab a kaki and dive in! 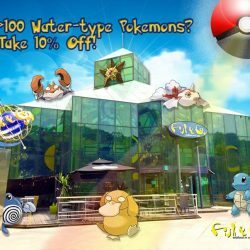 Flash these Deal of the Day coupons at Fish & Co and get $10 off min. spend of $50, 50% off 2nd pasta, $15 off Christmas Platter Set and 1-for-1 Grilled Fish! Valid till 17 December 2015 from Monday to Thursday so grab the offers now! Terms & Conditions apply. Seafood lovers rejoice! 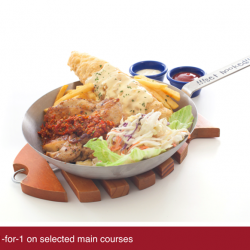 From now till 31 August 2015, Fish & Co is offering 1 for 1 selected main course at their neighbourhood outlets! 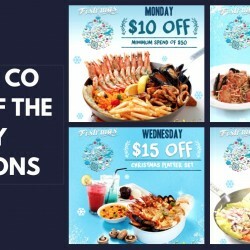 If you stay near Sengkang, Pasir Ris, East Coast or Sembawang, you can head to Fish & Co with your friend or loved one to get your dinner at the cost of 1! Note that this is not valid on weekends or eve of PHs and PHs though. 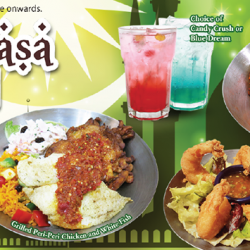 Fish & Co. is having Buka Puasa Special. 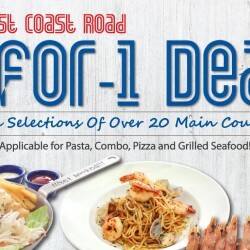 Visit your nearest Fish & Co. restaurant now to enjoy various great deals. Valid till 17 July 2015. 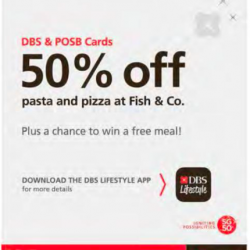 DBS & POSB Cards brings you 50% off Pasta and Pizza at Fish & Co. Plus a chance to win a free meal! Valid till 30 April 2015. Not valid on weekends. T&Cs apply. 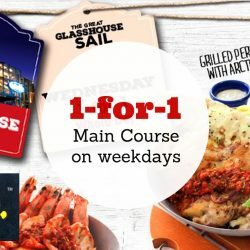 Catch an awesome deal everyday with 1-for-1 on main courses at Fish & Co! Exclusively with UOB Cards! 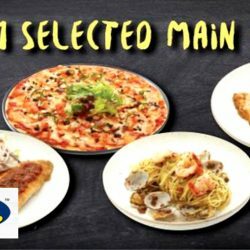 Choose from Mediterranean Pizza, Shrimp & Clam Aglio Olio, Grilled Peri Peri Chicken with Arctic Fish & Louisiana Chicken Gumbo. Valid till 30 Sep 2014. Applicable for one card redemption per bill. 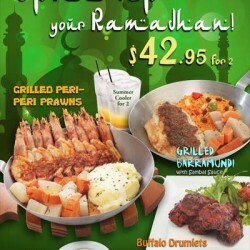 Enjoy Ramadhan set menu special at $42.95 for 2! Set includes a grilled peri peri prawns, a grilled barramundi, a plate of buffalo drumlets and 2 summer drinks. Top up $3 for 2 soup of the day!